One of the hardest-to-get reservations in the Triangle is for a spot in a basement room that looks like a Holiday Inn breakfast buffet lounge. But hundreds sign up for a lottery to earn a spot at one of the 40 tables. The appeal of the restaurant goes beyond the food – diners are helping students perfect their culinary and hospitality skills as they prepare for jobs. Flavors is run by the Culinary Arts and Hospitality programs of Wake Tech Community College. Culinary students select menus and prepare the food, baking students prepare breads and desserts, and hotel management students are servers and run the front of the house. They do all this, under supervision of instructors, three days a week for 10 weeks out of the 16-week semester. 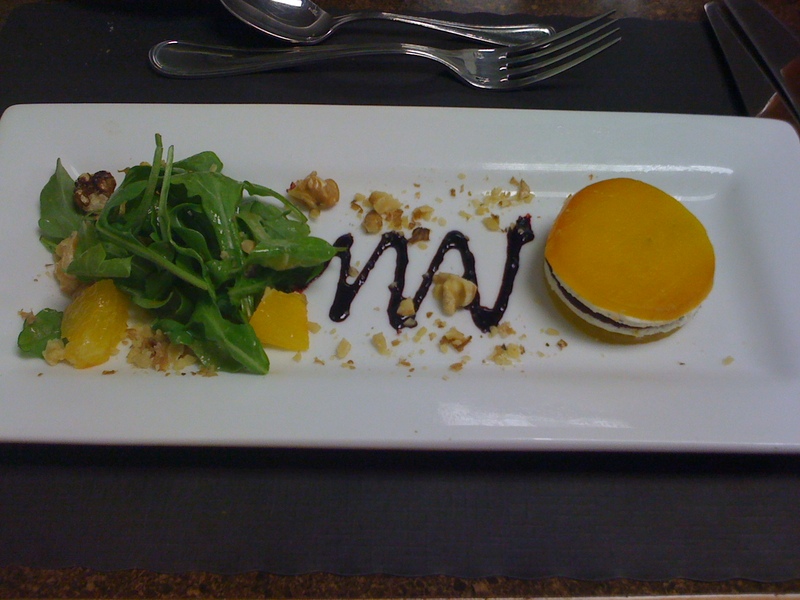 The Culinary Arts Program is one of Wake Tech’s most popular. Many students enter believing that a show on The Food Network is just a couple of classes away, then discover just how much hard work is involved in a culinary career. That’s why organizers say the attrition rate is as much as 60 percent. “Some don’t even make it through one semester,” says Fredi Morf, a chef instructor there since 1986. But for students with a true interest in culinary careers and hospitality, and a willingness to work hard, the program offers high-level professional training with a teacher-student ratio of 8 to 10 students per instructor. Morf says that the Culinary classes are about evenly split between men and women, despite the macho image of restaurant kitchens. However, when they visit France – as a group is planning to do, making sausage to sell to raise money for the trip – the female students are often the only women in the kitchens. I was Morf’s guest for a lunch on one of the Classic Cuisine days (others are titled Global Cuisine). I selected the chef’s special first course, a layered beet salad with herbed goat cheese – although the Chicken Consomme with Quenelles at a nearby table looked like an extra-good version of chicken soup with matzo balls. The third option was Rissoles Bouquetiere, which my server described as a filled turnover. The combination of beets with goat cheese is classic, and I always enjoy it. 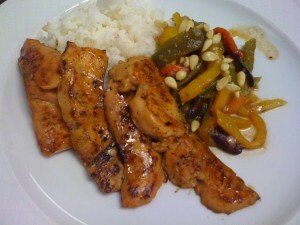 For an entree, I selected Seared Salmon with Roasted Pepper Salad and Basmati Rice. I was worried about overcooking when the soy-marinated salmon arrived as slices, but they were moist and tender. The slightly chilled pepper salad, which included raisins, pine nuts and serrano chiles, was an interesting contrast. The other options were Grilled Medallions of Beef Tenderloin Bearnaise and Allumette Potatoes, Sauteed Chicken Breast Provencal and Couscous, and Vegetarian Risotto. Since working on my taxes has increased my need for chocolate to combat the associated depression, I selected the Marjolaine for dessert: a layered stack of chocolate-hazelnut mousse and whipped cream with blueberries. The other options seemed just as good: Apple Crisp and Chai Latte Cake. There is no photo of my Marjolaine because, well, I couldn’t wait and ate it. But look here for an idea of it. To sign up for a Flavors reservation, visit here. I am reading a new book and planning my summer pastimes. It’s not a travel book, though. It’s a canning book. I was canning before canning was cool, when most people looked it as something their grandmothers did, and far too much trouble. Now, it’s hip. Young singles haunt canning sites on Facebook and see the delicious value in making their own items. Chefs boost their eat-local stock by canning their own sauces and relishes. 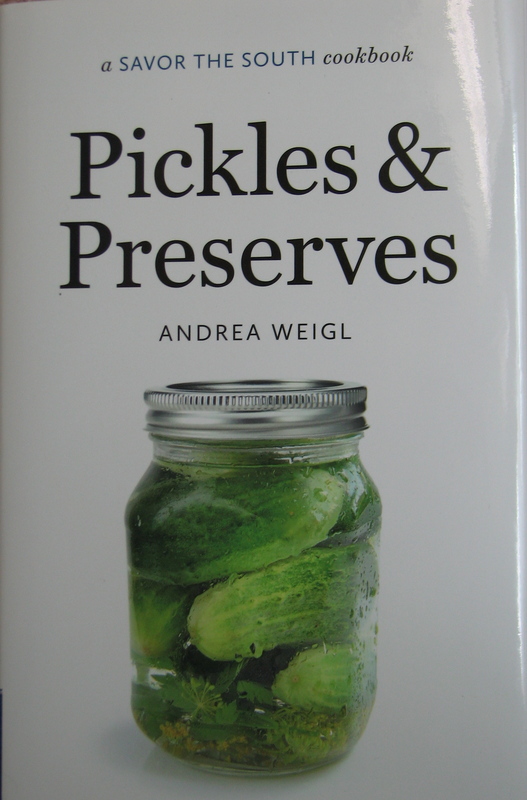 So any new book about making pickles, relishes, jams and jellies needs to walk a line between the classic favorites – I dare you to feed me something better than good-old homemade bread and butter pickles – and new-wave creativity. 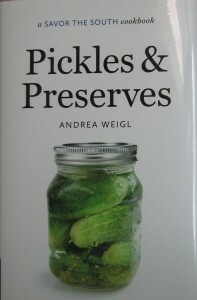 “Pickles and Preserves: A Savor the South Cookbook” by Andrea Weigl (University of North Carolina Press, $18) does that. Classic Dilly Beans and Fig Preserves are next to Soft Refrigerator Honeysuckle Jelly and Salt-Pickled Cucumbers with Shiso, providing basics for those new to canning and intriguing combinations for experienced canners. None of the recipes are so far out as to intimidate, and the variety will amply stock a pantry. Full disclosure: I contributed a recipe to the book, and have written another in the Savor the South series. I have also begged for figs from Weigl’s neighborhood and intoxicated a book club with Brandied Peaches from her book. On Wednesday night, March 12, Weigl will talk and sign copies of the book at Quail Ridge Books in Raleigh, on March 25 at the Barnes & Noble in Cary, and at Flyleaf Books in Chapel Hill on March 19. Other signings are listed here.